In a recently proposed 10-year development plan, Singapore aims to go from being "a garden city" to "a city in a garden." The proposal marks the latest milestone in the city's decades-long effort to become an eco-city. The image up top shows some of the biodiversity-inspired structures that will make up Singapore's $829 million "Garden by the Bay" project. The project is just one of the many undertakings that highlight Singapore's impressive development as a city in recent years — not just in the way of population and productivity, but sustainability as well. According to the New York Times, the last 25 years has seen Singapore's population double, all while its green cover (measured by the appearance of green planted areas on satellite photos) has increased from a third of the city-state's area to nearly half. The impact of Singapore's biodiversity efforts have been substantial. In the last ten years alone, the region's National Parks Board has seen around 500 new species of flora and fauna either reemerge or appear for the first time. 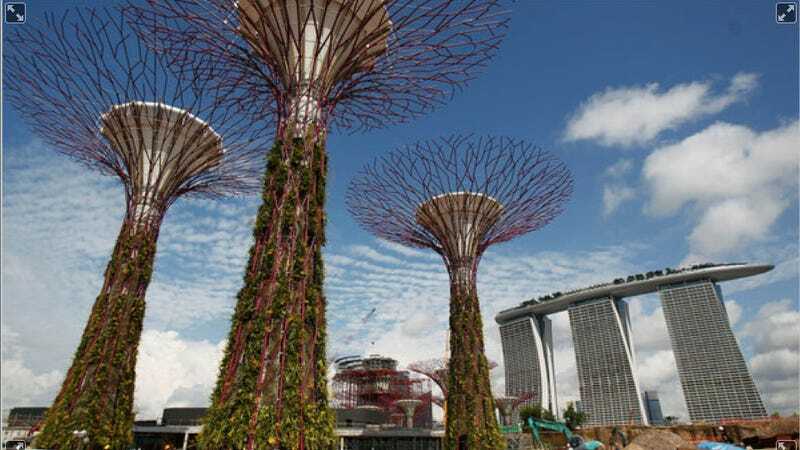 Members of Singapore's government also believe that the city's environmental efforts have gone a long way in attracting foreign investment and biotech companies.